Great selection of food, hot and cold. Lovely setting. Enjoy an animal encounter during one of the most important meals of the day! Be greeted at the table by elephants, orangutans and snakes during Jungle Breakfast With Wildlife. 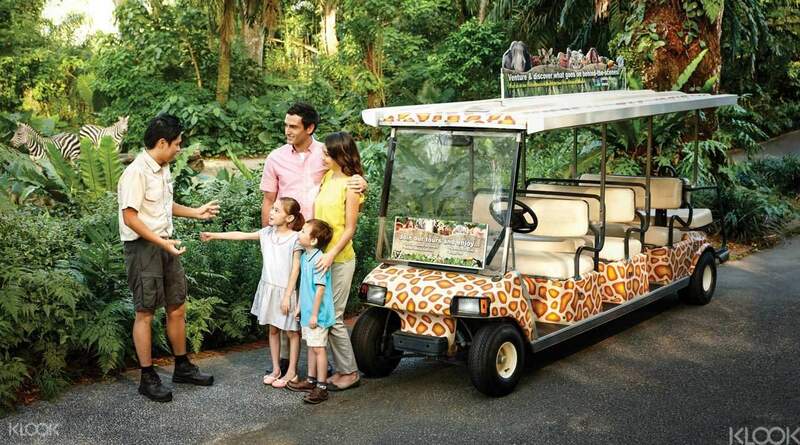 The award-winning breakfast program is set in one of Forbes Traveler's best zoos in the world (2007), where animals roam freely in their nature-resembling habitats, separated from visitors only by moats and wooden fencing. This breakfast takes that intimacy up another notch! 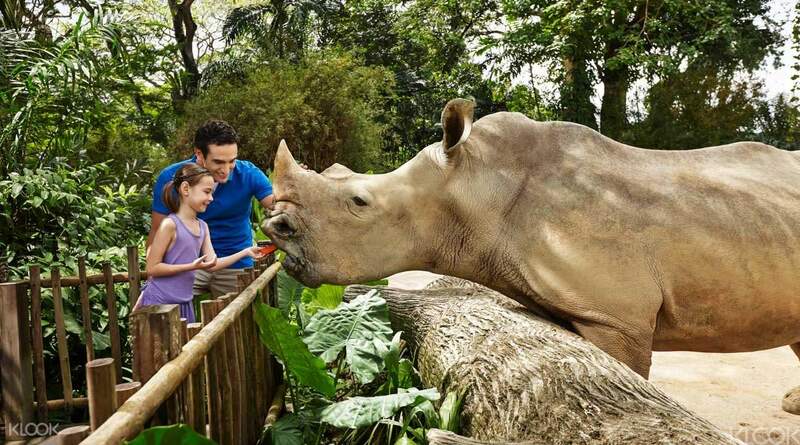 Plus, you'll also get full access to the zoo to experience one of the most iconic Singaporean attractions. For the kids and kids at heart: enjoy! Share your meal with giraffes, orangutans, elephants and more! Great experience for kids. We enjoyed breakfast with the orangutans (they were eating fruit too) and took pictures with them after the breakfast. The food was yummy and the guide was knowledgeable. You could see squirrels running around too. The whole thing was educational and fun. Great experience for kids. We enjoyed breakfast with the orangutans (they were eating fruit too) and took pictures with them after the breakfast. The food was yummy and the guide was knowledgeable. You could see squirrels running around too. The whole thing was educational and fun. A fun experience, particularly for animal fans like us. Buffet food wasn't super fantastic, but about what I usually expect from zoo fare. Of course, the food wasn't really why we went. The orangutan family was adorable and fun to watch, especially the little ones. The photo line moved very quickly and announcer did a good job keeping audience engaged while waiting (for those who needed more than strictly cute animal entertainment). Souvenir photos were expensive ($35 usd) but that's to be expected from this type of event and the staff was kind enough to also take a couple of photos using each family's cell phone. A fun experience, particularly for animal fans like us. Buffet food wasn't super fantastic, but about what I usually expect from zoo fare. Of course, the food wasn't really why we went. The orangutan family was adorable and fun to watch, especially the little ones. The photo line moved very quickly and announcer did a good job keeping audience engaged while waiting (for those who needed more than strictly cute animal entertainment). Souvenir photos were expensive ($35 usd) but that's to be expected from this type of event and the staff was kind enough to also take a couple of photos using each family's cell phone. One of the best zoo in world. Ignore the heat and enjoy with family. The shows invloves the animals, birds are must watch activity. Tram rides are best to beat the heat. One of the best zoo in world. Ignore the heat and enjoy with family. The shows invloves the animals, birds are must watch activity. Tram rides are best to beat the heat. Amazing Bucket List Experience! Breakfast was delicious and we took our time and ate so much. The photographers were very accommodating and took lots of different shots for us on our cameras. Not too crowded. Amazing Bucket List Experience! Breakfast was delicious and we took our time and ate so much. The photographers were very accommodating and took lots of different shots for us on our cameras. Not too crowded. It was such an enriching experience. We have a scrumptious hearty breakfast with a wide range of delicacies. The staff was friendly and efficient too. And of course the close up with the star of the show was unforgettable. It was such an enriching experience. We have a scrumptious hearty breakfast with a wide range of delicacies. The staff was friendly and efficient too. And of course the close up with the star of the show was unforgettable. We arrived early at SG Zoo with our 22 month old toddler around opening time. We were first in line because we wanted to get a good seat. But when we were choosing the best seat, the lady redirected us to a different table. She said those seats are already reserved online. But I told her it didn't give us an option to reserve the seats online when we bought the tickets in klook. But because we were first in line, she allowed us to stay at the side with the view of the orangutans though it was a bit far (Not the best seat but it will do) The food was just average. Giving it a 4 star because our baby super enjoyed the experience. We arrived early at SG Zoo with our 22 month old toddler around opening time. We were first in line because we wanted to get a good seat. But when we were choosing the best seat, the lady redirected us to a different table. She said those seats are already reserved online. But I told her it didn't give us an option to reserve the seats online when we bought the tickets in klook. But because we were first in line, she allowed us to stay at the side with the view of the orangutans though it was a bit far (Not the best seat but it will do) The food was just average. Giving it a 4 star because our baby super enjoyed the experience. 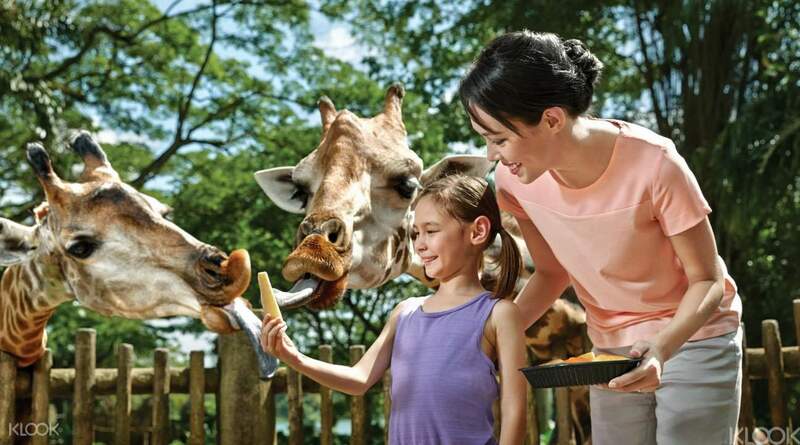 Breakfast at Singapore zoo is a good start to your demanding day at zoo. Breakfast here is not only sumptuous but also full of options. 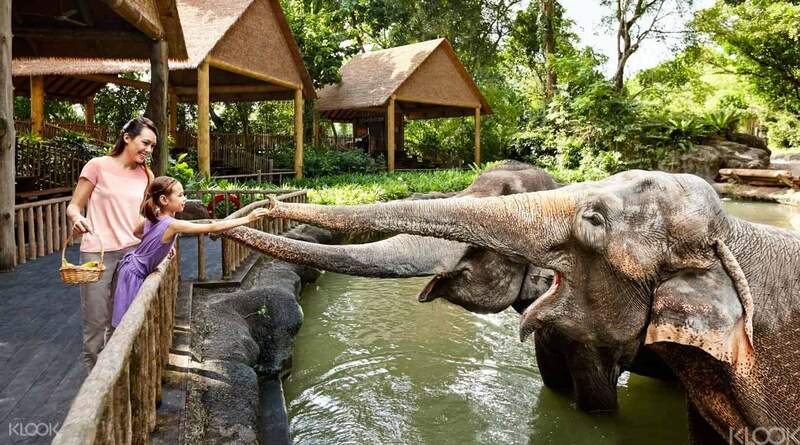 Moreover, your kids are bound to feel exhilarated by seeing orangutans and snakes and other animals coming to meet them at the breakfast area. Breakfast at Singapore zoo is a good start to your demanding day at zoo. Breakfast here is not only sumptuous but also full of options. 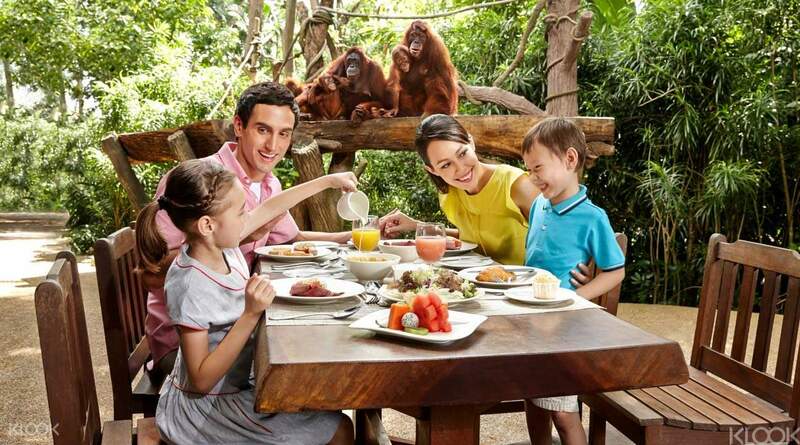 Moreover, your kids are bound to feel exhilarated by seeing orangutans and snakes and other animals coming to meet them at the breakfast area. easy to redeem vouchers. was a very yummy breakfast. heaps of food to choose from. great opportunity to hold a snake and get our photo taken with the orangutans. staff very friendly and helpful. was a great experience and good value for the money. easy to redeem vouchers. was a very yummy breakfast. heaps of food to choose from. great opportunity to hold a snake and get our photo taken with the orangutans. staff very friendly and helpful. was a great experience and good value for the money.